Seiko’s popular and incredibly successful Prospex (Professional Specification) watches for sea, sky and land are characterised by their commitment to being built to standards that allow the watches to be used by professionals in each of those categories. Today’s post is about an addition to the Prospex dive watches – a new ‘Turtle’ called the Ref. SRPC44. In 1976 Seiko launched the Ref. 6309, a diving watch with a cushion case shape that was very reminiscent of the dive watches of that period. 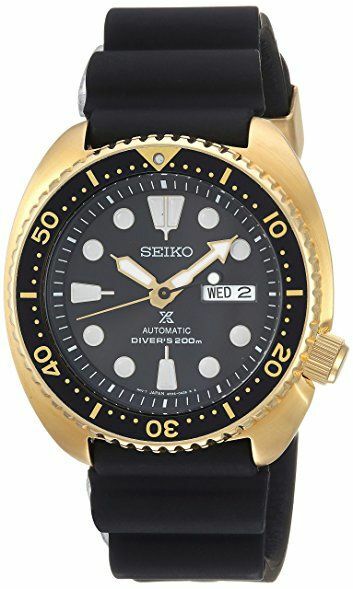 With its legibility, reliability and durability, it became one of Seiko’s most popular dive watches during until the cessation of its production in 1988. It also garnered, as is inevitable with Seiko dive watches, its own nickname, the ‘turtle’, for it case shape. It wasn’t until 2015 that Seiko decided to bring back the Turtle, with the introduction of the Prospex SRP77x collection. 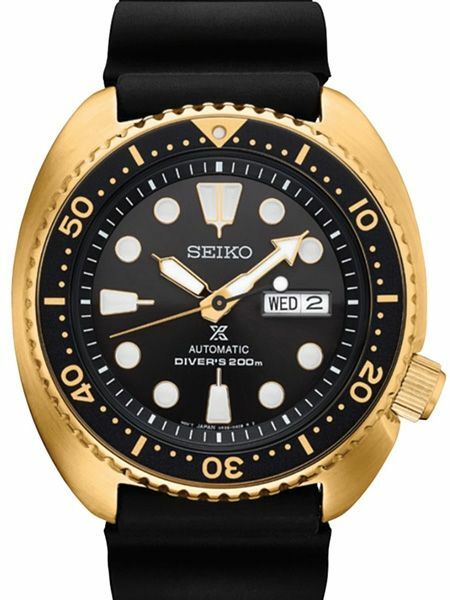 The 21st century Turtle has also proven to be popular, and Seiko has just announced a rather dressy new addition, the Ref. SRPC44. It’s all about gold, with a 45mm sized case of stainless steel gold PVD. It is 13mm thick, and has a water resistance of 200m. Beneath a Hardlex mineral crystal is a black dial with gold-outlined hands and indices that are treated with Seiko’s proprietary Lumibrite. Inside is the automatic Seiko in-house Calibre 4R36 that beats at 21,600VPH and has a power reserve of forty-one hours. It is a diving watch after all, so the Golden Turtle comes on a 22mm silicone strap with a matching gold PVD buckle. All of this comes with special packaging – the water resistant Prospex utility box, the same one (for those familiar with it) that comes with the PADI Samurai. The RRP for this shiny new Turtle is USD525.